4. Are there any teenagers that don't have latent super abilities these days? The Metro games have always worked a very specific shtick: nuclear war’s left the world a scorched wasteland and Russian survivors live underground in the metro train tunnels. Previous installments have seen short trips to a caustic dusty surface but Metro Exodus turns everything upside taking place almost completely above ground as Artyom and his team take a train across Russia. The above surface setting gives this threequel a more open world feel, spreading its tunnels and enclosed stealthy gameplay around large areas you can explore freely for side missions, supplies and more. Despite that massive change, the patient feel of hunting your enemies is still there as you play through a story that lasts an entire year. 7. Will Jump Force have legs in the fighting game community? 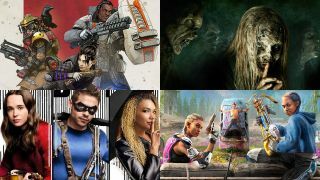 Release Radar picks the best games, movies and shows of the next seven days every Monday at 10am GMT.